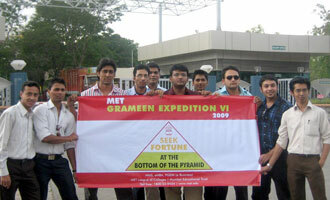 MET Schools of Management organised a series of rural visits through the MET Grameen Expedition. The aim of these visits was to encourage the students, to make them aware of the industries that flourish in rural Maharashtra and also familiarising them with the rural market, its demands and customers. Moreover, the main thought behind the expedition was to supplement the knowledge received in the classroom and help students see its applicability in the real world. The students visited industrial units at Baramati, Ahmednagar, Aurangabad, Solapur, Ratnagiri, Nasik and Kolhapur in Maharashtra.